Venus and Jupiter appear in conjunction over Delhi’s historic Lodi Gardens. This photo was taken by Ajay Talwar of The World at Night on March 13, 2012. 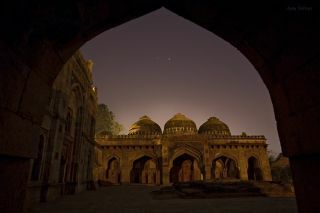 Outshining Delhi’s urban glow, Venus and Jupiter appear in conjunction over historic Lodi Gardens in this night sky photo. Astrophototgrapher Ajay Talwar of The World at Night captured this stunning image March 13, 2012, from Delhi, India. Venus and Jupiter appeared to get closer and closer in the sky earlier this year. On March 13, the two bodies were only three degrees apart from our view in the night sky and then passed each other in what astronomers call a conjunction. Venus, the dot on the right side, appears to shine more brightly because it’s closer to us than Jupiter on the left. The orbs shine above historic Lodi Gardens in New Delhi where ancient tombs of Indian emperors dot the greenery in the park.